We've been lucky enough to work with Kevin on some second screen thinking and one of the things he's made me realise is - it's not the nature of the screen that's important, it's the nature of the attention. Secondary Attention is a different beast and one we'll have to think about differently. Our default habit is to design media that trys to grab all the available attention. (Normally meaning all the optical attention.) And that's getting us into trouble. It's why Dentsu/BERG's work here is so clever -it's designed to be respectful of our primary attention, offering something quick, quiet, useful or rewarding in the moments we can spare it some mind. That's why it offers such an attractive alternative to the Blade Runner/Cillit Bang scenario. Those of us with backgrounds in advertising should already be thinking about this because we've all read Robert Heath on Low Attention Processing and should have realised how much we can communicate with someone who's not really watching. But, it seems, we can't learn those lessons, we refuse to be humble and quiet. We want all the attention, for as long as possible. And, Kevin's presentation here, made me wonder if that's part of the problem with AR. It's trying to insert itself right in the middle of your primary attention when a lot of the stuff it's trying to deliver is only worthy of being around the edges. So maybe what's actually interesting now is experimenting with secondary attention, in various different ways, playing with modes like glancing rather than staring. 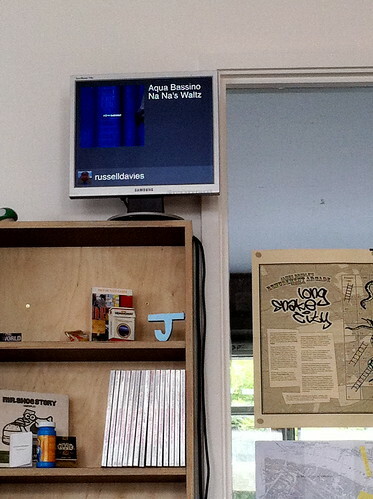 Many of my favourite examples of Secondary Attention apps seem to get auditioned on this little screen in the BRIG. There's always something interesting up there, varying from dashboardy stuff to the playful or restful. 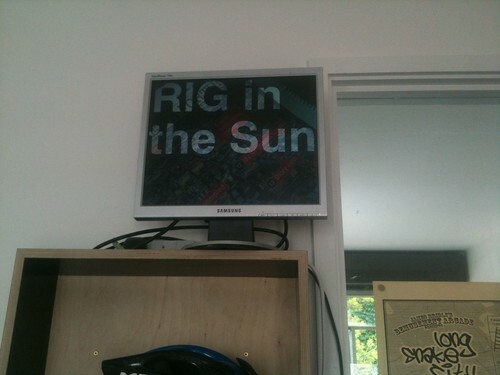 Above, for instance, is James Wheare's BRIGTunes, which the RIG has been happily been living with for a while. And, inspired by You Are Listening To Los Angeles, space shuttle activity tends to see the screen tuned to NASA TV accompanied by a drum and bass podcast to create a sort of joyful-wistful-ambient-science-show. And, the ipads in the office, or the laptop screens next to the monitors tend to be tuned to dextr or some other little attention toy. James Bridle is the master of this stuff. He's been building all these lovely things, designed for the coming super-abundance of screens, when they won't be burdened with the obligation to deliver important attention-grabbing information but will be superfluous and cheap enough to be left in the corner and glanced at occasionally. Romance has lived too long upon this river, for instance, shows you, quietly and beautifully, the height of the Thames tide. It's somewhere between art, craft and technology, between a snow-globe, a screensaver and a painting. Or there's Robot Flaneur - which Chris has neatly described as Ambient Tourism. Thinking about Secondary Attention properly will yield new uses for screens; Slow Television might be one, but the thing that's exciting me most will be elsewhere, it'll be screenless. It'll be based on sound. But that's a post for a different day.